Delightedly bright 2nd floor corner condo in Killarney Lodge with 2 bedrooms /2 bathroom plus separate study off the sizable lounge opening to the dining area and open kitchen. 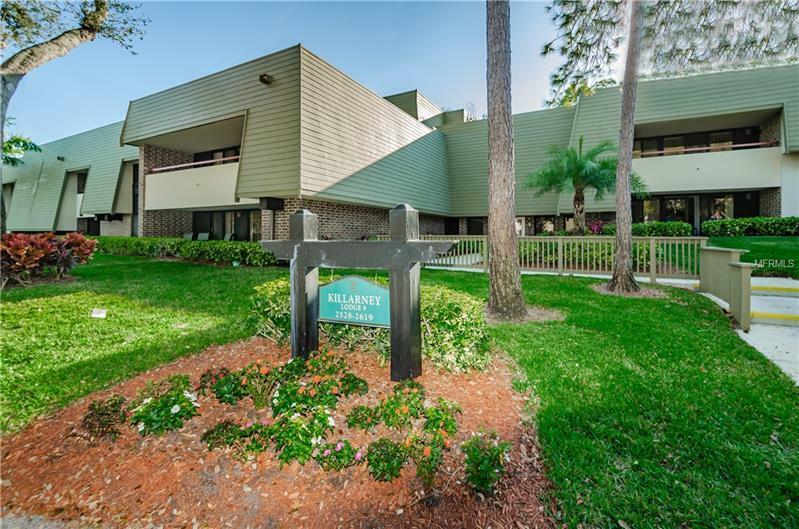 The condo is within easy walking distance of the Loch Ness Pool and the main restaurant attractions Innisbrook offers including the Osprey with outdoor fire pits and Market Square Grill. Fabulous views from the wrap around deck overlooking the 2nd and the 4th fairways on Osprey South. The position of the condo shields vehicular noise making the area exceptionally quiet. The wrap around porch is an ideal place to enjoy morning coffee or a relaxing evening drink. Unlike many Innisbrook condos, this offers a full-sized washer with separate dryer, recessed ceiling lighting throughout, all stainless steel appliances including a French door fridge with freezer, range with full sized oven, microwave, dishwasher and wine cooler. With crown molding throughout, newer cabinets, recessed lighting and electrically operated blinds, condo offers a unique fresh and bright countenance. An on-demand water heater to boost the holding tank offering continual hot water availability. A tastefully decorated condo with newer furnishings included in the listing price (excludes artwork, kitchen crockery and utensils and linens) at an exceptional value. Innisbrook Resort offers 4 golf courses, 11 tennis courts, 6 pools, excellent security and serenity. Great environment for walking, jogging, cycling with both diverse and interesting bird life.